I have to admit, I joined the Avocado Toast movement much later than I should have. No, no, I didn't wait till yesterday. I've had a few orders of these at cafes around the city. And finally, I got around to trying them out at home. I don't know if I've mentioned it here before, but I'm totally smitten with avocado. I can eat them plain, maybe topped with a tiny sprinkling of salt and a squeeze of lime. I love the way an avocado lends itself to so many recipes and uses. It is creamy, picks up flavors so well and can cool down an otherwise spiced up meal. I have tried a chunky guacamole before and I can just eat that stuff by the spoonful. Throw in a few tortilla chips and I can have a party for one (**wink, wink). I have also attempted a quick and easy Chocolate Avocado Mousse - so very delicious and it makes a perfect eggless mousse option. I can't wait to try out many more recipes using avocado. What is your favorite way to enjoy an avocado? Leave me a comment and let me know. I'd love to try it out too. 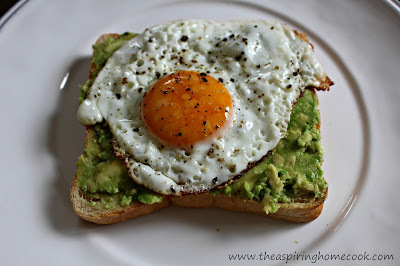 Now, onto the Avocado toast I made for breakfast over the weekend. Since this was a first attempt for me, I decided to keep it simple. I've seen some pretty extravagant avocado toast options around and maybe someday I will try them out too. But there's nothing wrong with simple. And simple and yummy makes it even better. So if you love ordering avocado toast at a cafe, I urge you to get into the kitchen and try whipping some up yourself. You will save yourself a heap of cash (which means more avocado for you.) The Lord knows these little green gems cost an arm. Speaking of which, if you find yourself around a Harris Farm Markets outlet, check out their Imperfect Picks range. They have mini avocados for $7.99 a kilo, when I saw them last. A lot of fruit and veg is discarded because of ridiculous aesthetic standards maintained by large supermarket chains and anything that doesn't meet those specifications usually ends up in a landfill. These minis are so tasty but would typically be discarded because of their size. And how wrong is that. I love the Imperfect Picks range and urge you to support them too if you have the option. Back to the avocado toast. I made two options for hubby and me. One savory and one sweet. It made for a very satisfying breakfast and couldn't have been simpler to put together. Our savory one had a fried egg on top and our sweet one had some banana and maple syrup. There are no strict quantities for this recipe, so feel free to have some fun with it. Cut the avocado in half and discard the seed. Scoop out the flesh and roughly mash it up with a fork. Spread the avocado over the toast. Top that with an egg. I used a fried egg, sunny side up. 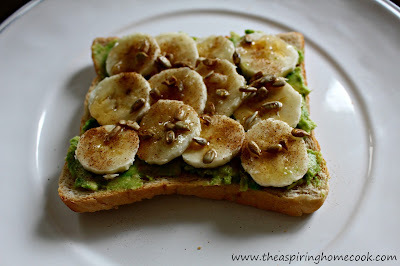 Top that with the banana slices, a sprinkle of cinnamon powder, the sunflower seeds and lastly, a drizzle of maple syrup. Note: I haven't been compensated by Harris Farm Markets for this post. The opinions stated here are my own and I've shared it with you because I strongly believe we can cut down waste as a society by just being more aware.